A major task for the THPC Environmental Unit during the four years of Extension Project construction was ensuring that the company's strict environmental standards were upheld across the 30 sites and camps involved in extending the plant. International-standard safeguards were built into the project design and contractors were required to prepare site-specific Environmental Management Plans that included all sub-contractors. THPC monitored compliance with environmental regulations and inspected all sites on a weekly basis. Specific activities managed by the Unit included spoil disposal, quarrying, hazardous materials, water discharge, dust and noise control, site traffic and unexploded ordnance. THPC provided a landfill site to dispose of non-hazardous waste during construction and this is now used by local villages. To ensure community waste is managed properly, the company provided training on waste management and set up recycling initiatives. 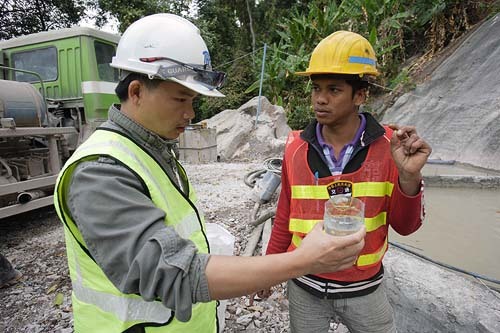 Various methods were used to recycle or dispose of potentially polluting waste from the construction period. For example, used oils were sent to a high-temperature incinerator at a steel plant in Paksan, where they were used as fuels in the industrial process. Waste which could not be safely disposed of has been placed in safe storage until a permanent solution is possible. Good rehabilitation of construction areas - essential to the success of the project – began in early 2012 and by the end of that year all temporary camps and most sites had been rehabilitated: structures dismantled, hazardous waste removed and ground and slopes re-vegetated. Contractors had to fulfil their environmental restoration obligations under THPC supervision before receiving final payments. 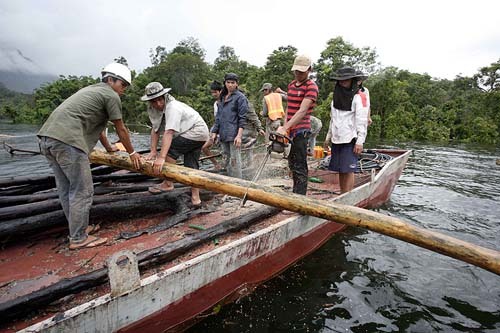 Another important duty was clearance of biomass from the Nam Gnouang Reservoir area ahead of impoundment, followed by removal of debris from the surface once the lake was created. Biomass clearance, completed in May 2011, reduces decomposing vegetation, which consumes oxygen, and creates a better environment for fish and for downstream water quality. So far water quality in the reservoir has been good, with fish catches increasing.